Money Mania is a sweeping account of financial speculation and its consequences, from ancient Rome to the Meltdown of 2008. Acclaimed journalist and investor Bob Swarup tracks the history of speculative fevers caused by the appearance of new profitable investment opportunities; the new assets created and the increasing self-congratulatory euphoria that drives them to unsustainable highs, all fed by an illusion of insight and newly minted experts; the unexpected catalysts that eventually lead to panic; the inevitable crash as investors scramble to withdraw their funds from the original market and any other that might resemble it; and finally, the brevity of financial memory that allows us to repeat the cycle without ever critically evaluating the drivers of this endless cycle. In short, it is the story of what makes us human. 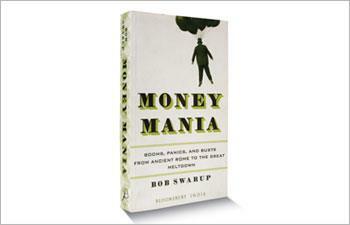 Bob Swarup is a respected investor, thought leader and commentator on financial markets, investments and regulation. Born in India in 1977, he was educated in England. He holds an MA from the University of Cambridge, two Master degrees, and a Phd in cosmology from Imperial College London. He has managed investments at financial institutions, sat on the boards of hedge funds and private equity firms, worked closely with leading think tanks, advised policymakers and industry alike, and is an award-winning journalist. He lives in London. Global economics is something that has always intrigued me. More so because of my decade long career in finance or perhaps my sheer interest into how do things work in the economies of a world so big. This book interested me because of many more reasons than the above. One it is by Bob Swarup, someone I have looked upto always. Second it deals with twenty five centuries of financial bubbles, investment manias and human folly explained, with rich historical detail and an insider's financial acumen. Nothing can get better than this. This is one book I took my own sweet time to complete purely because I would read a page of two, read more on the internet and then come back to the book. It satiated my curiosity to an extent that once I finished reading it I felt as if I had witnessed these events personally. I didn't read on internet because the author had left it incomplete. I did it because there were things which were beyond my understanding and yet I wanted to understand them better before I moved further. Like it is said in the book financial crisis are for us today what natural disasters were for our ancestors. The author with his deep knowledge of it all, has managed to present the facts in such a detailed manner that it feels like reading an encyclopedia on finance. Going back to the history of money and economies and coming to the future, knowing why it all happened, how it all happened and could it have been saved were some of the questions that haunted me till I read this book. It answered all this and much more for me. Strongly recommended book for people with a background in finance or who enjoy reading such books purely for the thrill they bring along. This book is like sponge cake - soft, goey and delicious to the last bite.